Mike Enzi, born February 1, 1944 (age 75), is a conservative Republican United States Senator from Wyoming. He was elected to the United States Senate in 1997 and has been reelected ever since. 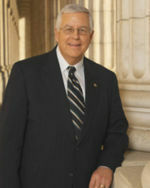 Over the course of the current (110th) Congress, Enzi has voted with a majority of his Republican colleagues 88.6% of the time, as of March 22, 2008. He previously served in the Wyoming Air National Guard from 1967-1973. This page was last modified on 26 September 2018, at 13:31. This page has been accessed 5,224 times.